It has often been said that our span of awareness is a mile wide and an inch deep. The quality of our deeper life is frequently overlooked in our efforts to cope the daily demands and expectations of our outer life. One enabling metaphor that helps us look at this is the ecology of a tree. The outer life is symbolized by the leaves and branches – they correspond to a life of reactivity and busyness – of action plans, performance goals, desired outcomes and results. Sometimes we direct our attention down a little, to the trunk and lower limbs. Here we look at structures, strategies and processes. Where we spend the least of our time is the ground underneath. Yet it is the roots and the soil that give the tree resilience and the strength to grow and weather sudden changes year after year. The shift from focusing on the trunk and the branches to the ground beneath corresponds to a shift of awareness from a factory/ production to a more adaptive/ artful mindset. 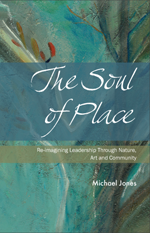 Giving our attention to the undersoil beneath an organization, a community- or a tree involves an artful process of creating form out of the ambiguous circumstances and variable conditions we find ourselves in. This includes the very precise and complex interaction among many subtle variables including energy and space as well as tone, atmosphere, rhythm and time. The language shifts from structure and action to story, to metaphor, to felt experience and the underlying stillness that holds it all. Leaders shift from being managers to also being stewards and gardeners tending to the quality and well being of the soil so that our gifts can find fertile ground in order to take root and grow. Root systems, like artists, learn to adapt in the moment as they search for soil conditions that are most fertile and ‘alive’. As such they inquire, sense, absorb, invent and change course in the moment as they feel their way in the search for connective and fertile ground. Roots systems also co-mingle sharing their moisture with other root systems without diminishing their own health and well being. Yet we are still influenced by an industrial age mind set that impedes our ability to adapt creatively in a time of complexity and sudden change. We still tend to rely, not on our own deep intuition but upon the perfection of external authority, of preconceived, of sequenced actions and mechanisms for scheduling and control. What can we do to create the conditions for healthy roots system in our communities and organizations? We need to release our industrial age or mechanistic ways of thinking – including our narrow needs for planning and control – in order to accept a much wider range of variations and possibilities. This corresponds to the musicians open stage, where their repertoire and what they do well may need to be set aside in order to be open to the aliveness of the moment – and to follow its leading wherever it may go. In other words, in a regenerative culture the process itself IS the content. As such, it tends to unfold based on what feels most right – alive and true. It cannot be preconceived or created fully in anticipation of or out of a concept formed in advance. As a pianist and composer, I go over a composition time and time again listening and feeling for the underlying pattern that is emerging from beneath. In this way, I make a lot of mistakes and go down blind alleys as I explore the emerging compositions many changing ways. Each iteration contributes to enhancing and enriching my auditory imagination so that I am able to make better aesthetic choices later on. In this context to be iterative is not to correct errors or mistakes but to engage them so as to be more aligned with a process of emergence that lies beneath. Working in this way holds within it a sense of taking our art into our body, such that there is a sense of both naturalness and simplicity to it even when it may appear difficult and complex to someone observing it from the outside. While a regenerative process may often appear random, chaotic and even wrong headed from the point of view of the observer, it is actually highly efficient, coherent, even elegant and inevitable when experienced from within. The reason for this is that a living process unfolds within ‘liminal space’ one in which the continuity and smoothness of transitions generally unfold naturally and organically. This is particularly true when we trust that the container itself carries the seed of it own unfolding potential for what is to come next. It is when we try to move ahead by force of will or through tension, urgency or effort that this internal order is disturbed and our progress impeded. One primary qualification for guiding others in a regenerative process is less on what we know and more upon our capacity for holding presence with what is not yet known. That is, to be curious and open to whatever is emerging in our awareness that appears to be fuzzy, ambiguous or unclear. This capacity for sense making is amplified when we are together and diminished when we are apart. That is, there is a power that comes to us when we meet as an ‘ensemble’ where, for a moment, we forget ourselves and work for the benefit of the larger whole. Creating spaces for exploring what we do not yet know, spaces where we can be present to what is unformed and incomplete, sets in motion a process of unfolding order, a practice which has always been familiar for the artist but unfamiliar to others who have been educated into a more parts – based mentality that is common in the industrial world. Once this living process is initiated, it will follow along the trajectory of its own unfolding potential – one that is natural, organic and unrepeatable – and which reflects the expression of wholeness as it appears to us in that particular moment. All work is half rest. Nature cannot thrive in full flower all the time. Nor can we. We need time to empty to digest, assimilate and to be still. Dormancy and decay are as a much part of the life force as is growth and flowering. The absence of this deep time of gestation can lead to confusion and erosion of the force of life itself. Wayne Muller in his book Sabbath reminds us that a successful life can also be a violent life. To live a deeply rooted life is to find and create a home for oneself. Plants can only grow as high as they grow deep. To do otherwise is to be at the mercy of the atmosphere. We can only blend with its strong forces if we are deeply rooted within ourselves. Too often the sense of duty and responsibility overrides our intuition and good judgment. It becomes difficult to settle. Yet As Wayne Muller suggests, the world aches for just that – the generosity of well rested people. Mintzberg, Henry and McHugh, Alexandra “Strategy Formation in an Adhocracy” Administrative Science Quarterly, 30, no 2 (June 1985) 160 – 197 Found in Artful Waking P 26. This entry was posted in Placebased Leadership and tagged regeneravity. Bookmark the permalink.